Last evening, Mr. Andrae Goodnight brought the character of the Servant of God Father Augustus Tolton to life for the first time in the Diocese of Springfield on the stage of the Effingham Performance Center in a convincing, masterful, and moving performance. This one-man play is written and produced by St. Luke Productions, a Catholic acting company dedicated to bringing the lives of the saints to life through engaging quality dramatic presentations. The set of the play is rather simple, but this is no reflection on the quality of the script, the acting, or the actor. To portray other characters, such as Martha Jane Tolton, audio/visual equipment is used of recordings of portrayals by other actors and actresses. At first, I was a bit skeptical of this approach, but within only a few moments I saw how well the stage-actor and the recorded-actors blended together. Rather than being hokey - as, at first, I thought it might be - this is a clever way to increase the quality of the drama while keeping costs down. 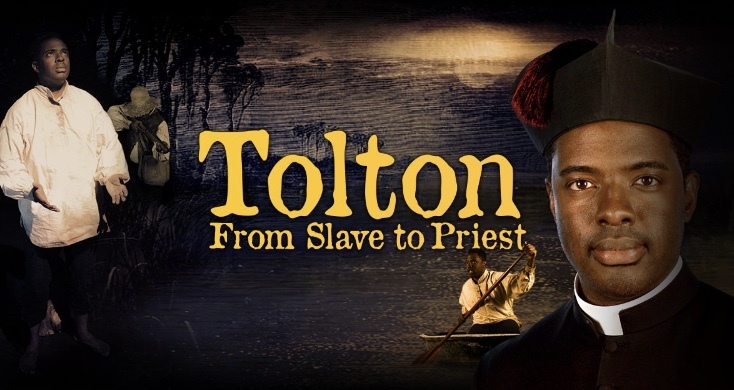 Running under 90-minutes, Tolton: From Slave to Priest presents the essential elements to understand the life and story of Father Gus in a manner that gets to the heart of the issues. It shows forth the virtue of the first publicly known black priest in the United States of America and shows why people - Catholics and Protestants alike - both supported and opposed him. It shows the turmoil of his heart and his fidelity to Christ Jesus and to his Church. And, as it does all of this, Tolton: From Slave to Priest also includes a few references to the more common aspects of his life, such as his playing of the accordion (an unexpected and welcome inclusion). If you do not yet know the story of the first citizen of the Gem City, you will after seeing Tolton: From Slave to Priest; if you do know the story of Father Gus, you will surely gain a deeper appreciation for the witness of his life while watching this performance. JACKSONVILLE - The second performance will be held on Wednesday, November 8th at 7:00 p.m. in Jacksonville at Our Saviour church. The performance, I think, will be free to all attendees. DECATUR - The third performance will be held on Thursday, November 9th at 6:30 p.m. in Decatur at Our Lady of Lourdes church. A free-will offering will be taken. SPRINGFIELD - The fourth performance will be held on Saturday, November 11th at 7:30 p.m. in Springfield at the Cathedral of the Immaculate Conception. A free-will offering will be taken. QUINCY - The fifth performance, and the one to which I am most looking forward, will be held on Sunday, November 12th at 3:00 p.m. in Quincy at the Pepsi Arena of Quincy University. A free-will offering will be taken. GRANITE CITY - The sixth and final performance will be held on Monday, November 13th at 7:00 p.m. in Granite City at Holy Family church. A free-will offering will be taken. Just prior to the performance, I was asked to give a brief presentation on the canonization process in general, which i was happy to do. As I visited with people after the performance, one of the men I spoke with had been a recent concert by Johnny Cash at the Effingham Performance Center, the very same venue where Tolton: From Slave to Priest was performed. He told me there were more people in attendance for Tolton than there were for Johnny Cash. That is not bad praise! Do yourself a favor and watch the play. Father, I meant to make it to the Granite City performance but ended up busy with work instead -- much to my regret. Sounds like a wonderful event. I also wondered if perhaps the gentleman you spoke to actually referred to some performer other than Johnny Cash...as Mr. Cash (God rest his soul) died in September 2003. It's possible it was a cover band; the man used the word "recently", but I suppose that could mean different things to different people.